R-7516-SPRT 16 Hamilton Heavy Duty Gound Support Pneumatic Rigid Caster. 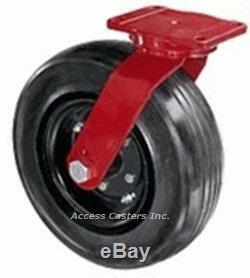 16 Hamilton Heavy Duty Ground Support Rigid Caster. 16" x 5-1/8" Heavy duty solid pneumatic tire with tapered bearings. Designed for ground support tow applications. 6-1/8" x 7-1/2" top plate. 4-1/8" x 6-1/8" Bolt Hole Pattern Drop forged construction. Visit Access Casters' About Me. Casters are to be used for manual operation, consult Access for temp ranges not listed on our website. Special ordered product may not be returnable or cancelable. Loss or Damage in Transit. All claims for damage or loss should be taken up with the transportation company. Please note damage immediately to the transportation company. Items needing 2 weeks or more are noted in the item. We assume no liability for lost profit, incidental, or consquential damages due to delay, factory error, or product failure. The item "R-7516-SPRT 16 Hamilton Heavy Duty Gound Support Pneumatic Rigid Caster" is in sale since Friday, January 20, 2017. This item is in the category "Business & Industrial\MRO & Industrial Supply\Material Handling\Casters & Wheels". The seller is "jkcasters1" and is located in Chicago, Illinois. This item can be shipped to United States, to Canada.